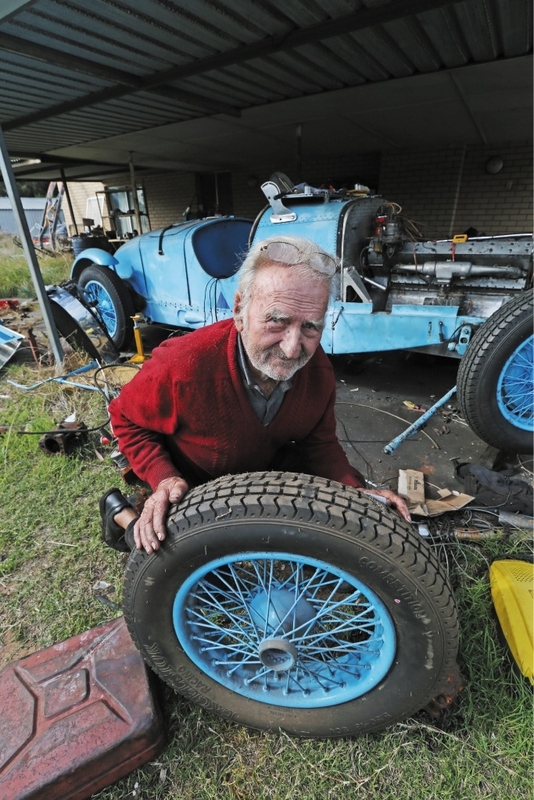 JIM Krajancich has enjoyed a long love affair with his 3-litre Italian Ettore Bugatti, which was built in 1932. Bugatti built only two of these cars to race in Europe. The number five car was a two-door touring car which used to race on the Continent and was imported to Australia in the late 1940s in a private collection. By then the car had notched up a number of competitive races, but no firsts. The car had raced in the Ulster TT, Isle of Man and Monaco Grand Prix and later Le Mans, and it was also part of the Caversham Grand Prix in 1962. Mr Krajancich (84) said some of the famous racing car drivers who had raced this Bugatti in Europe included Francis Curzon Earl Howe the fifth, Jean-Pierre Wimille and Pierre Levegh, who crashed his then car into an Austin Healey, his works Mercedes disintegrating with the axle flying into the stands and killing 84 spectators, including himself, at Le Mans in 1955. “It is widely regarded as the worst racing car accident in the world,” Mr Krajancich said. Before he died, Levegh raced the Bugatti for the then owners in Europe. “When Francis Curzon raced it he had a history of burning the clutch out because the motor was too strong,” Mr Krajancich said. Mr Krajancich had admired the Bugatti from afar at West Australian car race tracks, including Pingelly, Albany and Applecross. And he could not believe that when it came on the market, he could buy it for less than a new FJ Holden the same year in 1958. Mr Krajancich bought the car in disrepair and he has been working on it ever since – nearly 55 years. Today there is little wrong with it, despite its eight cylinders. The Bugatti is tipped to be faster than an E-type Jag in a straight line. Mr Krajancich said he had driven it at 100mph on the race track in the past, but the timing was out in the harmonic balancer and it popped its bolts. The car has been re-conditioned but retains the original frame and engine and transmission. The homespun mechanic is replacing the crankshaft which has been specially made in Europe. “I can’t start it up too often; it sounds like a jet plane taking off,” he said.